There is a video game series called Fallout. It is a good video game series. It basically takes the idea that all of the 1950s “World of Tomorrow” optimism had happened, but then it got nuked. Centuries after, civilization slowly starts to pick up the pieces, and you have adventures. Well, the latest game in the series, Fallout 4, was just announced (it’s technically the 4th, 5th, 6th or 7th installment, depending on how you count). And it takes place in Boston. And, guess what, folks? Fenway’s still standing after WWIII! Oh, sure, it definitely has been updated and changed with various post-apocalyptic armor and stuff being added, at least partly so that they don’t have to pay royalties, but that’s definitely meant to be Fenway. There’s even a statue of a ballplayer in front. 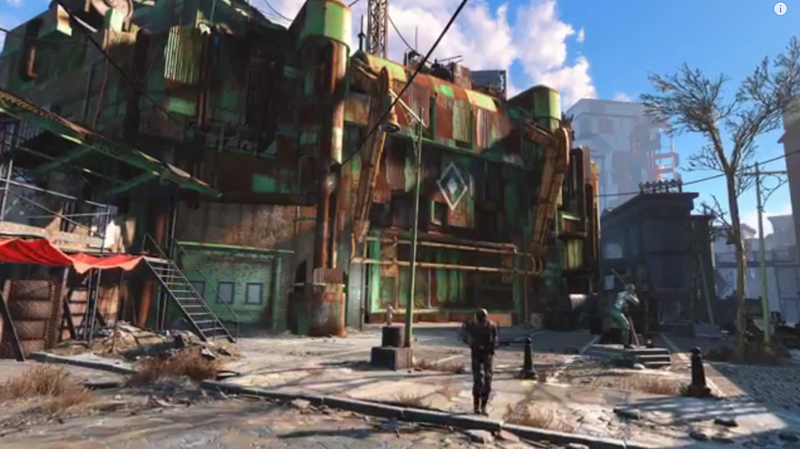 Oh, and what’s more, elsewhere in the trailer they show some sort of post-apocalyptic market built nearby filled with baseball-named establishments, presumably Yawkey Way and/or Kenmore Square- or, actually, probably inside Fenway itself (“Diamond City”). A nice touch by the developers to pay tribute to Boston’s love of baseball. Rest assured, when the game comes out, I’ll make sure to do a Bizarre Baseball Culture looking at the baseball elements in Post-Apocalyptic Boston. This entry was posted in Baseball, MLB, Video Games and tagged baseball, BOS, Boston, Fallout 4, Fallout baseball, Fallout Fenway, Fenway, Fenway Park, FO4, FO4 Fenway, Red Sox, video game by danglickman. Bookmark the permalink.